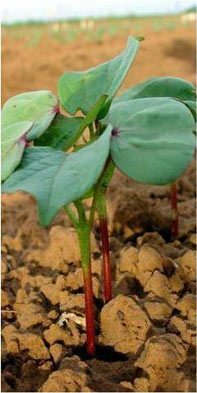 The cotton plant is a warm-season woody perennial shrub, which is grown as an annual field crop. Because the plants are grown in various environments, cotton farmers can choose from many varieties of cotton that are bred to be productive in various environmental and cultural conditions. After the seeds are planted and the plants begin to grow and develop, they must be protected from insects, diseases and weeds. Before harvesting, the plants are defoliated to prevent foliage from interfering with mechanical harvesting. Approximately 85% of the total U.S. crop is machine picked and the remaining 15%, primarily from Texas and Oklahoma, is machine stripped. Machine pickers harvest cotton from open bolls, leaving unopened and empty bolls on the plant. This is accomplished with revolving spindles which pluck the fiber out of the boll. Machine strippers strip the entire plant of opened and unopened bolls. The fiber removed from the plant also contains the cottonseeds and is referred to as “seed cotton.” The harvested seed cotton is transported to the gin. Ginning, in its strictest sense, is the process of separating cotton fibers from the seeds –– the process revolutionized by Eli Whitney’s invention of the cotton gin in 1794. Today’s cotton gin is required to do much more. To convert the harvested cotton into marketable products (fiber and seed), gins have to dry and clean the seed cotton (removing plant parts and field trash), separate the fiber from the seed, further clean the fiber, then place the fiber into an acceptable package while preserving its quality. American upland cotton is “saw ginned.” Saw gins use cylinders with saw teeth to pull seed cotton between ribs, thus separating the fiber from the seeds. Saw gin stands can operate at capacities as high as 12 (480-lb) bales per hour. Approximately 835 saw gins are located throughout the cotton-producing regions in the United States. Pima cotton is “roller ginned.” Roller ginning, a slower, gentler process than saw ginning, is limited to the areas that produce Pima cotton (West Texas, New Mexico, Arizona, and California). 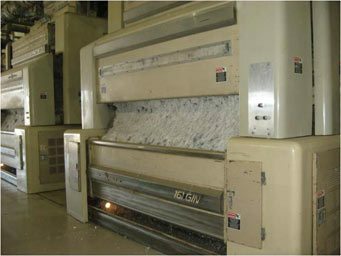 The ginning process yields two products with cash value –– cotton fiber and cottonseed. After ginning, the fiber is compressed into bales. At this stage, the fiber is referred to as “raw cotton.” Samples are taken from both sides of each bale and sent to the U.S. Department of Agriculture for classing. The cottonseeds removed during ginning are shipped to cotton oil mills. Short fibers (“linters”) that were not removed by ginning remain on the seeds. At the oil mill, the linters are removed from the seeds by delinting machines, employing the same principles as saw gins. If seeds are run through a delinting machine once, the linters produced are known as “mill-run linters.” Most mills run the seed through twice, producing “first-cut” and “second-cut” linters. First-cut linters consist of longer, more resilient fibers and are used in many nonwoven products. Second-cut linters consist of shorter fibers and are used to produce high-grade bond paper and as a source of cellulose in the chemical industry. After the linters are removed, the cottonseed is converted into food for people, feed for livestock, fertilizer and mulch for plants. Another by-product of the ginning process is “motes.” Motes are small, immature seeds with fiber attached. They are removed at a different stage of the ginning process. The fiber can be removed from the motes by a delinting machine. This fiber, called “gin mote fiber,” is also used in nonwoven products.